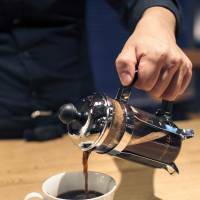 From the hip barista conjuring latte art to the kissaten (traditional Japanese coffee shop) owner working an archaic siphon machine, there’s a lot of fuss and theater involved in preparing coffee. So it can be hard to get excited about the French press sometimes. It’s the saxophone of brewing methods: any old idiot can get the hang of it it after a few tries. There’s some flashy equipment behind the counter at the Nishi-Azabu branch of Maruyama Coffee, but the method of choice here is the humble cafetiere. 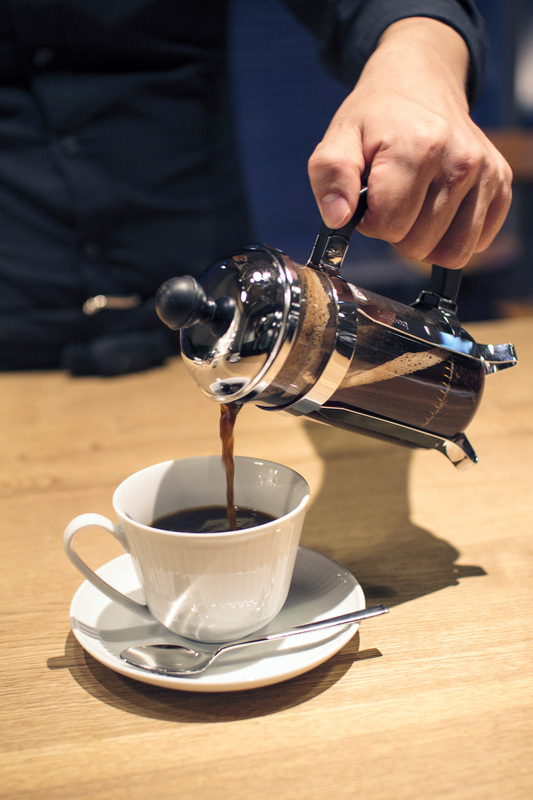 As barista Seiya Yamashiro explains, the shop favors French presses for the same reason it uses metal filters in its high-end Steampunk machine and Cores gold filters for its drip brews: to retain the coffee’s all-important oils. “We want to extract as much of the natural flavor as possible, without anything getting in the way,” he says. Paper filters, your days are numbered. As Yamashiro explains, it’s a mark of respect for the coffee’s growers. Rather than impose the store’s signature on the beans that it roasts and brews, Maruyama Coffee aspires to act as a conduit between producers around the world and drinkers in Japan. The company, which began in Karuizawa, Nagano Prefecture, in 1991, is famously picky about its beans. In 2001, founder Kentaro Maruyama rallied a group of Japanese buyers to take part in the international Cup of Excellence auctions, where bidders compete for the world’s most highly prized coffees. Maruyama Coffee has been a regular presence at the auctions ever since, and has placed a few record-breaking bids along the way. In the past few years, the company has become equally known for the caliber of its service. Its staff won the Japan leg of the World Barista Championship for five consecutive years, and in 2014, Maruyama’s Hidenori Izaki walked home with the world title. Asked about the training process for baristas, Yamashiro can’t help laughing. “It’s very demanding,” he says. The atmosphere at the Nishi-Azabu branch, which opened in late 2013, feels more akin to a hotel lounge than the current wave of specialty coffee shops popping up around Tokyo, with their penchant for DIY furnishing and industrial chic. Here, customers sit on comfy sofa chairs at well-spaced tables, while the baristas work discreetly behind the bar. The menu has the depth of an extensive wine list, and stretches to seasonal specials and pairing sets that serve coffee alongside dried fruit and chocolate. “A lot of our male regulars have a bit of a sweet tooth,” Yamashiro says with a smile.